I had to go to Sephora for some of my beauty must-haves, and I picked up this Cheek Stain (in Blissful and for $30) as a total impulse buy. Considering that I still made it out of the store spending less than $100, which is a near-impossibility for me and my poor impulse control and my lofty makeup snobbery, I'm calling the trip a success. It's super easy/dummy proof to put on. Like a gliding gel-type stuff. The color I got is a very nice neutral that I think would flatter most skin tones. And it blends in perfectly. And it's not flaky or cakey or anything. And, and, and. It's wonderful. Listen, I'm leery about blush, and I love it. This is the first blush I've ever loved ever in my whole life. I tried to buy some back in November of '08, but the experience was....laughable at best. 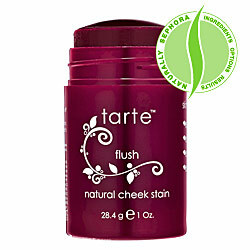 I bought my Tarte Cheek Stain with mah own moneh! I don't get jack diddly if you buy this stuff, beyond my own happiness if you like it as much as I do. If someone wants to pay me for writing this, that's cool I guess. But it hasn't happened yet. THAT sounds like something I would love to try. I might have to check it out! Thanks for the review!! Today is the first day of the rest of my week! We can't all be winners, or CAN we?